A beautiful plot with a building licence for a 3 bedroom villa and pool at a bargain price for a quick sale. This excellent plot of 400sq.m. 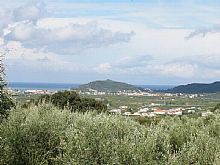 with stunning, uninterrupted sea and mountain views to Kefalonia and Alikes located in the traditional Greek village of Kallithea is a bargain not to be missed. The plot is in the plans and has a building licence for a villa of 100sq.m. with 30m2 of open verandas plus a 5.5m x 3.5m pool. The villa has an open plan living, dining, kitchen area, 3 bedrooms and 2 bathrooms. External stairs lead to a large roof terrace and spectacular views. The price is only 35,000 euro so if you are interested you will have to move quickly.